You select the samples you want to buy and then you must enter the code and details in the order form which will be open in a new window or another tab in the browser. When you have completed your mineral list, you must enter your full name and email address along with the shipping address / billing. You must indicate if you are going to pay by credit card, bank transfer or Paypal. To complete the order must complete the box with a security code that appears to prevent automated access to the "no-human". Proceed to submit the request. 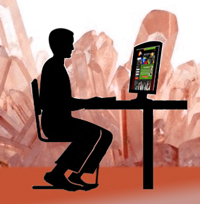 Rosell Minerals will receive your order and we will confirm by email the availability of the specimens you request, the total amount (with detailed shipping costs) and / or suggestions about the order. In case your specimen has been sold just before your request, we will notify you and offer other similar specimens. Credit Card: Payment for orders placed through our website uses a completely secure transaction system. Bank Transfer: We will send the account data. 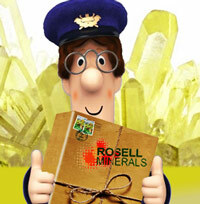 You can send a copy of the receipt online at: info@rosellminerals.com. After receiving receipt or confirmed your payment we will process your order. Paypal: You can connect to the secure payment through our link. Once payment is confirmed your order will be sent by registered mail unless otherwise indicated. To the products and minerals sent to the European Union we apply certified mail rates, return receipt confirmation. Under your request, your order will be sent by Courier or Messenger applying the additional costs. If you wish to have your specimens posted via Courier (SEUR, DHL, Fedex), please confirm it. All customers are entitled to a 20 calendar day grace period from receipt of the purchase, for you to view specimens and decide if you wish to keep the specimen or return it. Money paid for the specimens, except the initial cost of postage, will be refunded upon receipt of the returned specimen on time, and in good condition. Minerals for sale on this website are owned by Rosell Minerals and they are priced in EURO (€), and payment will be charged in EURO (€). 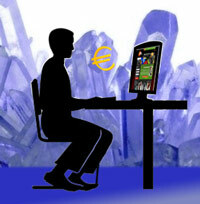 Main price is in Euro currency and all other amounts in different currencies are given. Your bank will set the final rate of exchange for your purchases. Instruments, microscopes and books will be paid in Euro.